Quest "The Boar Hat" completed. Explored the Britannian map for the first time. All Seven Deadly Sins assembled. 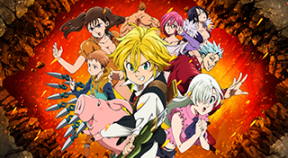 Meliodas awakened his demon power. Defeated Hendrickson after he attained the Ash Demon's power. Completed all main quests with "S" rank. Completed all side quests with "S" rank. Completed all quests in eastern Liones. Completed all quests in western Liones. Completed all quests in central Liones. Completed all quests in southern Liones. Completed all quests in northern Liones. Completed all quests in the capital city. Completed all quests with "S" rank. Acquired 100% of an area's Gossip Points. Acquired 100% of Gossip Points for all of Liones. Found Magic Crystals on the field map 100 times. Got a total of 100,000 Magic Crystals. Maxed out HP for all members of the Boar Hat crew. All combat-type Magic Items created. All adventure-type Magic Items created. All Boar Hat abilities enhanced. Fought with a Magic Item equipped. Won a battle with no damage. Landed a Co-Op Attack with a partner. Used Special Moves for all characters.